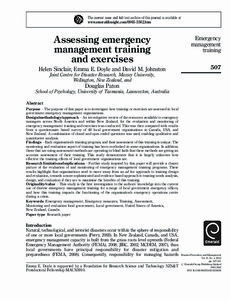 Purpose – The purpose of this paper is to investigate how training or exercises are assessed in local government emergency management organisations. Design/methodology/approach – An investigative review of the resources available to emergency managers across North America and within New Zealand, for the evaluation and monitoring of emergency management training and exercises was conducted. This was then compared with results from a questionnaire based survey of 48 local government organisations in Canada, USA, and New Zealand. A combination of closed and open ended questions was used, enabling qualitative and quantitative analysis. Findings – Each organisation's training program, and their assessment of this training is unique. The monitoring and evaluation aspect of training has been overlooked in some organisations. In addition, those that are using assessment methods are operating in blind faith that these methods are giving an accurate assessment of their training. This study demonstrates that it is largely unknown how effective the training efforts of local government organisations are. Research limitations/implications – Further study inspired by this paper will provide a clearer picture of the evaluation of and monitoring of emergency management training programs. These results highlight that organisations need to move away from an ad hoc approach to training design and evaluation, towards a more sophisticated and evidence-based approach to training needs analysis, design, and evaluation if they are to maximise the benefits of this training. Originality/value – This study is the first investigation to the authors’ knowledge into the current use of diverse emergency management training for a range of local government emergency offices, and how this training impacts the functioning of the organisation’s emergency operations centre during a crisis.